The Periclean Progress is a publication of Project Pericles, Inc., a not-for-profit organization that encourages and facilitates commitments by colleges and universities to include education for social responsibility and participatory citizenship as an essential element of their educational programs, in the classroom, on the campus, and in the community. Project Pericles is pleased to announce that The Evergreen State College is our newest member institution. Evergreen is our first campus in the Pacific Northwest. With the addition of Evergreen and Skidmore College, which joined earlier in 2015, Project Pericles has grown to 30 colleges and universities in 18 states. Project Pericles Executive Director Jan Liss visited The Evergreen campus in November. She met with President George Bridges, Vice President for Academic Affairs and ProvostMichael Zimmerman, and Director of the Center for Community-Based Learning and Action Ellen Shortt Sanchez. In addition, Liss met with Wendy Endress, Vice President for Student Affairs; Nancy Koppelman, member of the faculty and instructor in the Evergreen Student Civic Engagement Institute; and David McAvity, Academic Dean. Liss left impressed by Evergreen's commitment to civic engagement. "At its core, Project Pericles is about collaboration and leveraging our collective expertise in order to build stronger and more coherent curricular programs incorporating civic engagement and social responsibility. We are adding campuses that can significantly contribute to and elevate our conversations. Our board decided to extend an invitation to Evergreen given their demonstrated commitment to civic engagement and their interest in working with Project Pericles and its member institutions. We are extremely pleased to have them join Project Pericles and we look forward to working with their President, George Bridges, and the entire Evergreen community," said Liss. Each member campus appoints Project Pericles Program Directors to coordinate programs on campus and serve as a liaison to the national office. We are pleased to be working with Evergreen's Academic Grants Manager, John McLain and Member of the Faculty, Andrea Gullickson. Both Gullickson and McLain attended the Project Pericles Program Directors' Conference at Bates College in November. In addition to teaching, Gullickson is an oboist who has toured widely, performing in concert halls in the United States and abroad. McLain has long worked with students on civic engagement as part of the Evergreen Student Civic Engagement Institute among other projects. He helps students to explore and cultivate "humility, empathy, persistence, hope, patience, self-reflection, and a commitment to embracing complexity," or, as he puts it, "the virtues of civility and democratic engagement," and believes that Project Pericles will provide an even greater support structure toward that end. This fall, Bringing Theory to Practice (BTtoP) awarded Project Pericles a grant to study the impact of participation in courses with a civic component on student well-being. Periclean campuses will collaborate with the Project Pericles National Office on this study, which will be led by Project Pericles Assistant Director Garret Batten. Participating campuses will be announced in early 2016. This study will allow us to examine a number of high impact practices including first-year seminars and community-based learning courses and assess their impact on well-being. In addition, close attention will be paid to the impact of programs on Pell-eligible and first-generation students. This study of well-being builds on our current project, Creating Cohesive Paths to Civic Engagement (CCP). In discussing our new study, Batten said, "This study offers us the opportunity to look at the impact of different approaches to civic engagement on well-being across multiple campuses. Creating Cohesive Paths to Civic Engagement, has enabled us to examine issues of breadth and depth in terms of students reached by different approaches and overall organization of programming. This new study allows us to compare the impact of different approaches to civic engagement on student well-being and look at variations among student populations." We are delighted to announce that The Teagle Foundation awarded Project Pericles a grant for a Creating Cohesive Paths to Civic Engagement (CCP) convening on January 20, 2016 at the Council of Independent Colleges (CIC) in Washington, DC. The convening is an opportunity for campuses to reflect on their progress, share what they have learned with each other, and brainstorm about how to further this work. Through CCP, we have mapped curricular and co-curricular approaches to civic engagement on 26 of our colleges and universities, and identified five general approaches to organizing civic engagement curricula: Requirements; Pathways Approaches (theme based, i.e. education, food, health, etc. ); Civic Engagement Scholars Programs (intensive, multi-year, cohort programs); Certificate Programs; and Open Choice Models. The convening is an opportunity to reflect and build on promising approaches to civic engagement outlined during this three-year project. In addition to discussing different approaches, we will also focus innovative technological strategies for presenting opportunities to students and for tracking students' participation. Having an increased understanding of the particular approaches campuses are implementing and of the best practices associated with them. How to enhance advising to help students become aware of opportunities. Sharing information between campuses implementing similar approaches and promoting potential collaboration. Providing a venue for campuses to learn about alternative approaches that other campuses are pursuing. Listening to our member institutions to gain a better sense of how Project Pericles and our consortium can continue to advance this work. Utilizing new technologies for enhanced tracking and other innovative strategies for improving student outcomes. CCP was made possible through the generous support of the Eugene M. Lang Foundation and The Teagle Foundation. 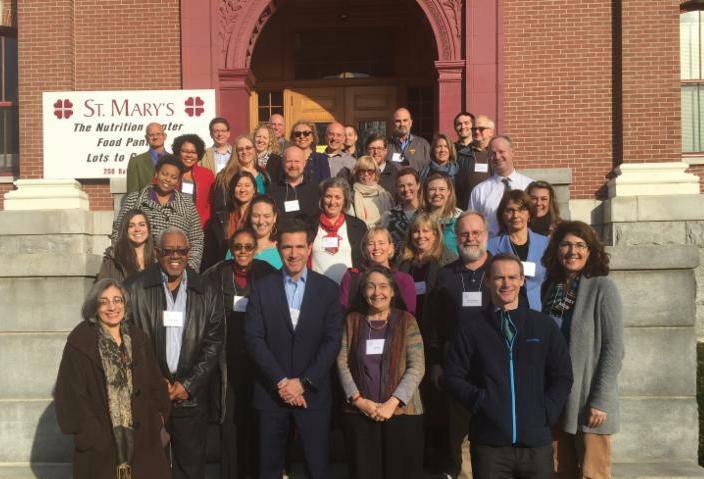 Bates College graciously hosted the 2015 Project Pericles Program Directors' Conference on November 10-11. The annual conference is an unparalleled opportunity for Program Directors to utilize the knowledge and expertise of the consortium to strengthen civic engagement and social responsibility (CESR) on Periclean campuses and in their communities. Project Pericles thanks President Clayton Spencer; Darby K. Ray, Director, Harward Center for Community Partnerships; Donald W. & Ann M. Harward Professor of Civic Engagement; and Project Pericles Program Director; and Kristen Cloutier, Assistant Director, Center Operations, Harward Center for Community Partnerships, and the entire Bates College community for hosting. On the first day, Jay Barth, M.E. and Ima Graves Peace Distinguished Professor of Politics, Director of Civic Engagement Projects, and Project Pericles Program Director atHendrix College led a discussion of successful approaches to engaging students in policy work and action. The group also enjoyed a lively discussion of the emerging sub-field of social entrepreneurship and innovation led by Paul Schadewald, Associate Director, Civic Engagement Center and Project Pericles Co-Director, Macalester College. The two-day conference included a dinner at President Clayton Spencer's house, a poster session led by current Bates students on their ongoing civic engagement involvement in areas including: affordable housing, America reads, and STEM education for elementary students. At lunch, the program directors enjoyed a panel discussion with Bates alumni describing how their undergraduate experience affected their paths. Two of the alums on the panel have gone on to careers in politics. Nate Libby '07 is a state Senator in Maine representing District 21, while Ben Chin '07 is the Political Engagement Director of the Maine People's Alliance. Chin came in first out of five candidates in the Lewiston mayoral race, but failed to secure a majority, losing a tightly contested runoff. Chin wrote: "I came to Lewiston in 2003, on a scholarship to Bates College. At the time, I wanted to graduate and go to seminary to become a pastor. But in 2004, our former city administrator tried to displace over 800 people from their homes through the so-called "Heritage Initiative." That's when I got involved with the Visible Community and Maine People's Alliance. After a year of hard work, we stopped the project. Eventually I decided community organizing would be a better fit for me than seminary." Chin is one of countless students to discover a passion for civic engagement through community involvement orchestrated by a Project Pericles Program Director on their campus. The self-discovery journeys shared by the students and alumni reaffirmed the importance of our work promoting CESR as intrinsic elements of higher education. On the second day, Christian Rice, Assistant Dean for Civic Engagement, Director, Bonner Leader Program and UCARE, Assistant Professor of Philosophy and Religious Studies, and Project Pericles Program Director from Ursinus College talked with the group about the importance of establishing clear learning outcomes for assessment purposes. This was followed by a presentation by Emily Kane, Professor of Sociology and Periclean Faculty Leader, Bates College, on community based-research and her experiences as a Periclean Faculty Leader. The group spent the remainder of the day discussing strategies to foster greater collaboration between Periclean colleges and universities and approaches for leveraging our institutions considerable expertise in designing and running civic engagement programs. The Presidents' Council Meeting took place on November 5 at Carnegie Corporation of New York. We were pleased to have a conversation with Carnegie's President, Vartan Gregorian; Geri Mannion, Program Director, U.S. Democracy and Special Opportunities Fund; and Ambika Kapur, Officer of Special Projects, National Program. Our Presidents had a productive meeting led by the Presidents' Council Chair, Richard Guarasci, President of Wagner College. They highlighted best practices from programs on their campuses, sought ways to increase collaboration between institutions, and discussed how Project Pericles can best advocate for the importance of civic engagement within higher education. Thank you to Carnegie Corporation of New York, Vartan Gregorian, Geri Mannion, Amkika Kapur, and the entire Carnegie staff for hosting our Presidents. Eugene M. Lang founded Project Pericles in 2001 to tackle the growing political cynicism and civic disengagement among young people. In 2016, Project Pericles will celebrate its 15th anniversary, and to honor Mr. Lang's vision we are expanding a program he cherished: Student Choices - Student Voices (SCSV). As part of the SCSV program, Project Pericles shared with its Program Directors helpful materials to engage students in the election process. The goal of SCSV is to both inform voters about the candidates and issues at stake while supporting efforts to register citizens to vote. To that end, a reference table containing registration deadlines and requirements by state was distributed in the beginning of the fall semester. Program Directors also received a document with activity ideas and useful websites to share with students and faculty. A Bingo game was created as a means to generate excitement and open a space for dialogue to accompany debate screenings. TurboVote offered a special promotion to Periclean colleges and universities to help track registration on campus and to facilitate the voting process. On October 14th, Wagner College students gathered to review how effective and ineffective dialogue can shape political perceptions through the Democratic and Republican Presidential Debates. This conversation was paired with the SCSV Bingo created by Project Pericles. The Bingo activity not only helped engage students with complex socio-economic problems, it provided a fun, interactive way to discuss democratic ideals. Carleton College's Creating Cohesive Pathways to Civic Engagement mini-grant from The Teagle Foundation and Project Pericles, in collaboration with Goucher College, made possible a new and comprehensive assessment system for our campus. Getting to this point has truly been a collaborative effort. Adrienne Falcόn, Director of Academic Civic Engagement and Project Pericles Program Director and Cindy Plash, the Center for Community and Civic Engagement's (CCCE) administrative assistant. Work on overhauling the assessment system commenced during the summer of 2014. Since then, the CCCE has worked closely with information technology services (ITS) at Carleton in order to create a system that can accurately capture the breadth and depth of students' engagement. "These things take a lot of time and patience," says Plash, "but it is well worth it." In the new system, all hours that students spend on civic engagement are captured in the same online location. At Carleton College, student civic engagement falls under several different categories: curricular, co-curricular, and paid positions. By working with ITS, the CCCE was able to create a system in which supervisors and peer leaders can record hours for students in each of these categories. Students, supervisors, and students' advisors can then pull up the summary of each of these categories in "the Hub", an online portal for personal student information. For example, one student fellow at the CCCE, Shira Kaufman '16, is able to see all of the Academic Civic Engagement classes she has taken, including her Sociology and Anthropology Methods course, as well as all of the hours that she logged for Eat the Lawn and the Food Recovery Network, two ongoing programs for which she volunteers. In addition, she sees all of the hours that she has logged through her paid position as a CCCE fellow during the year. Being able to see all of these contributions in one place allows Shira to get an overview of how she is spending her time. Shira's engagement demonstrates a clear passion for all things related to food. She and her advisor can use this information to help Shira understand how her interests have shifted and evolved throughout her time at Carleton and to plan for her future. As Periclean campuses continue to make a case for civic engagement, data collection tools such as Carleton's can help us tell our story. "When someone asks me how many hours of programming a program has done since the dawn of time....well, we can at least pull information as far back as 2004," says Plash. Reports can be pulled by issue area, program, term, or student and the data can be manipulated in a variety of ways. These reports have been useful both to show funders what is happening as a result of their support, and to help the CCCE understand itself better as it continues to evolve in response to student needs. Throughout the past year, Falcόn has also refined surveys that get at some of the more qualitative aspects of civic engagement work, such as student learning outcomes and community cohesion. Taken together, these assessment tools create a more holistic picture of the CCCE's work. Kelly Scheuerman, Program Director for Civic Engagement Pathways at the CCCE, says that even a first look at the data has helped illustrate the ways in which the CCCE engages with students. One important find, for example, is that more freshman volunteer than any other class year. Those students then go on to engage with their community in a great variety of ways. "[The data] makes a strong point for how important this work is to students," Scheuerman says. "We always had the sense that we are working with a lot of students, but now we are illuminating the robustness of the various programs, and the extent to which students are involved in not just one, but multiple ways." In October, our Executive Director Jan Liss visited Dillard University. She had a very productive meeting with President Walter M. Kimbrough; Vice President for Academic Affairs Yolanda W. Page; Associate Professor of Political Science and Project Pericles Program Director Gary Clark; Nick Harris, Director, Community Development; and Dillard's two student delegates to the 2015 D4D National Conference, Jacquelyn Fuller '16 and Hope Hill '16. Liss said, "It was extraordinary meeting with Fuller and Hill, who described what a life changing experience the National Conference had been for them and how they are working with Dillard students to empower them." Clark emphasized that the National Conference was one, among many, benefits of membership in Project Pericles. On October 1, Drew University celebrated the inauguration of MaryAnn Baenninger as the thirteenth President of the University. Jan Liss represented Project Pericles at inauguration events. As part of the festivities, Drew organized a symposium on engagement between the University and the city. Professor of English and Project Pericles Program Director Amy Koritz moderated "Stewardship, Service, and the Common Good: Re-Imagining University-City Partnerships" featuring Ira Harkavy, Founding Director, Netter Center for Community Partnerships, University of Pennsylvania. This was followed by "Organic Community: Universities, Cities, and Diversity" moderated by Christopher Taylor, Dean of the College of Liberal Arts and Professor of Comparative Religion and featured Caryn McTighe Musil, Senior Scholar and Director of Civic Learning and Democracy at the Association of American Colleges and Universities. On December 4, Project Pericles Executive Director Jan Liss visited New England College. Liss had a breakfast meeting with President Michele Perkins. President Perkins has led the college through a significant strategic planning and repositioning process, emphasizing a curricular focus on the civic and natural environment, as well as innovative pedagogical strategies such as experiential learning. Liss addressed members of the faculty providing an overview of Project Pericles approach to civic engagement and discussed our emphasis on embedding civic engagement in the curriculum. An approach, she noted, that New England College clearly shares. Liss also met with Provost and President for Academic Affairs Mark Watman, who was a key architect behind the strategic planning process. She had lunch with Periclean Faculty Leader and Co-Director of Creative Writing Maura MacNeil; Co-Director of the Center for Community Engagement and Leadership and Project Pericles Program Director Inez McDermott; and Associate Professor of Writing Brian Partridge, who previously served as the Project Pericles Program Director. She later visited with Wayne Lesperance, Co-Director of the Center for Community Engagement and Leadership and Professor of Political Science. Dana Brown, Executive Director of the Pennsylvania Center for Women in Politics atChatham University and Project Pericles Program Director is one of 26 members appointed to the Pennsylvania Commission for Women. Under that capacity, Brown will advocate for legislation and policies benefiting women and girls in the State of Pennsylvania. In addition, Brown also serves as a member of the Community Advisory Board for the YWCA Greater Pittsburgh Center for Race & Gender Equality, the Executive Women's Council and its Women on Boards Committee, and 74% Kitchen Cabinet atRobert Morris University Bayer Center for Nonprofit Management. She is a Pennsylvania delegate to the Vision 2020 program at the Institute for Women's Health and Leadership atDrexel University, the Ellis School's Council on Innovation, and serves on the Pennsylvania Advisory Committee to the U.S. Global Leadership Coalition. Project Pericles congratulates Dana Brown on her latest appointment, and wishes her continued success in all her endeavors. Widener University's Constitution Day 2015 featured Jim Vike, Associate Dean of the Social Science Division and Project Pericles Co-Program Director, who facilitated a workshop on the topic: "Civility and Engaged Citizenship." The workshop introduced Vike's research on variables that influence political engagement and activism. The audience engaged in an interactive discussion addressing the nature of contemporary civic life and the generally accepted expectations and responsibilities of modern citizenship. Vike examined the competing perspectives of civic duty and engaged citizenship and factors that may promote informed and civil political participation in a deeply polarized era. During the event, Vike presented a summary of campus initiatives that promote a culture of political engagement. Multiple levels of engagement that embed both curricular and co-curricular programs and activities are intended to develop the civic knowledge of undergraduate students. The Office of Civic Engagement hosted Constitution and Citizenship Day on September 17. In collaboration with the Student Government Association, the Office of Civic Engagement hosted a voter registration drive, polling for the upcoming presidential election, and provided students an abridged version of the U.S. Citizenship test. Fact sheets were provided to educate students about the candidates' positions on important issues. Additionally, the sophomore class of the Presidential Service Corps Bonner Program participated in training about citizenship. Assistant Professor of Education Mara Tieken from Bates College was one of eight scholars selected by the New England Resource Center for Higher Education and the Center for Engaged Democracy at Merrimack College for the 2015 Ernest A. Lynton Award for the Scholarship of Engagement for Early Career Faculty. The pool of candidates represents a range of institutions and disciplines. Ernest Lynton framed faculty scholarly activity as inclusive, collaborative, and problem-oriented work in which academics share knowledge-generating tasks with the public and involve community partners and students as participants in public problem solving. The community-engaged work of nominees serves as a model of the public scholarship that Lynton championed. Assistant Professor of Sociology Bernadette Ludwig, Wagner College's Project Pericles faculty liaison attended the Project Pericles Program Directors' Conference at Carleton College in the fall of 2014. There she learned about the Food Recovery Network (FRN) that Carleton College created. Ludwig returned to Wagner College and started a program this fall with the help of students Kirsty Hessing and Erica Curry, Associate Professor of Anthropology Celeste Gagnon Anthropology, and the Center for Leadership and Community Engagement. Since then, Wagner College students have been recovering food twice a week, averaging about 80 pounds of food that is donated to City Harvest, which distributes it to various soup kitchens around Staten Island. Wagner students have shown an overwhelming support for the program and the FRN leadership team at Wagner is in the process of adding additional recoveries. All Wagner College students participate in multiple experiential learning experiences throughout their time at Wagner. Most of this happens in placements outside of the Wagner Campus. The FRN is among the first efforts that enables students to become involved in a social justice issue right on campus. CIC Presidents Institute - Jan Liss and Periclean Presidents Mary Ann Baenninger (Drew University), Jonathan Lash (Hampshire College), and James H. Mullen, Jr. (Allegheny College) will present a session on the Creating Cohesive Paths to Civic Engagement work at the Council of Independent College's Presidents Institute, January 7, 2016 in Miami Beach. Project Pericles will hold a panel presentation, "Expanding our Reach: Innovative Approaches for Increasing Impact and Exposing Diverse Students to Curricular and Co-Curricular Programming Incorporating Civic Engagement " at AAC&U's Annual Meeting on January 21, 2016. Kristen Cloutier, Assistant Director, Center Operations, Harward Center for Community Partnerships, Bates College; Cass Freedland, France-Merrick Director of Community-Based Learning, Goucher College; Jan Risë Liss, Executive Director, Project Pericles;Ella Turenne, Assistant Dean for Community Engagement, Occidental College; andMarcine Pickron-Davis, Chief Community Engagement and Diversity Officer, Widener University will present on findings from Creating Cohesive Paths to Civic Engagement. Project Pericles will present a panel: "Creating Cohesive Paths to Civic Engagement: Intentionality in the Organization and Integration of Programming for Civic Engagement and Social Responsibility." D4D on the Road workshops are designed to provide novice and seasoned political activists with the tools and tactics they need to get their message across to policy makers, community leaders, and the public. Whether participants are interested in service, public policy, issue-based organizing, or advocacy campaigns, this highly effective workshop gives participants the core skills needed to start a new project or expand an existing one. They empower participants to effectively work within the democratic process to address pressing social, civic, and economic issues. Through these non-partisan workshops, Project Pericles has reached more than 3,000 students, faculty, staff, alumni, and community members on campuses over the past seven years. The Periclean Progress is also available on the Project Pericles website.